Well, so here we are in the month of November. It’s almost the end of the year. Ten full months have passed by and ‘time flies’ is an understatement! Well, wasn’t it just yesterday that we wished everyone a Happy New Year?! I am sure that as you read this your thoughts are wandering back to the beginning of this year and all the events that unfolded as the months rolled by. Have I accomplished anything significant this year? Have I kept up to the promises I made to myself? The New Year resolutions sometimes remain just resolutions. I am glad I don’t make any resolutions on Jan 1st anymore. Everyday is the 1st of January if you are serious about getting something done. Anyway, before I make this sound like a speech usually made on 31st of December, let me tell you that I have achieved many a milestone as far as my blog is concerned. Apart from the page hits & growing list of followers, I have made some great blogger friends. It’s amazing how we make more friends sitting inside the confines of our home via the internet than we actually make outside our homes. Friends we have never met check on us out of genuine concern when we disappear for a few days from the blogosphere. Among the many I would like to mention two such co-bloggers who I have never met before. Radhika of Tickling Palates who hosts Blog Hop Wednesdays and Charishma Shetty of Cherie’s Stolen Recipes with whom I am paired with for today’s hop. Schedule 1 of Blog Hop Wednesdays has been a very good experience and today is the beginning of Schedule 2. I was more than happy to note that I was paired with Charishma (Cherie) for three reasons. 1.) I had already tried & loved recipes from her blog earlier (and posted them too on my blog!) 2) Cherie has an amazing collection of recipes with a focus on Bunt style recipes – one of my most favourite cuisines. 3) She’s a friend! Ghee Roast is a preparation that is native to coastal Karnataka and apparently originated in Kundapur (near Udupi). It is one of the famous dishes on most restaurant menus in Mangalore and I have loved it for as long as I can remember. The best tasting Chicken Ghee Roast that I remember eating was at ‘Cellar’ – the little restaurant on the road that leads to St. Aloysious College from Bishop’s House, Mangalore. When I got my first job in Mangalore, I along with a group of colleagues would plan to have our lunches in style – at restaurants that served some great Mangalorean food. I’ve had many a Ghee Roast at several places but the one at Cellar was undoubtedly the best. However, strangely, I never attempted to make it after I set up my own kitchen. Blog Hop was probably the perfect reason why I decided to make it today. Chicken Ghee Roast is a marvellous invention that tastes best when made with the generous dollops of ghee that the recipe calls for. Don’t skip the ghee & replace it with oil (like I tend to do for most recipes) – it will greatly alter the taste & it would be like killing the main ingredient. However, feel free to reduce it like I did. I am sure it will taste divine if you use home made ghee but store bought ghee works just fine. 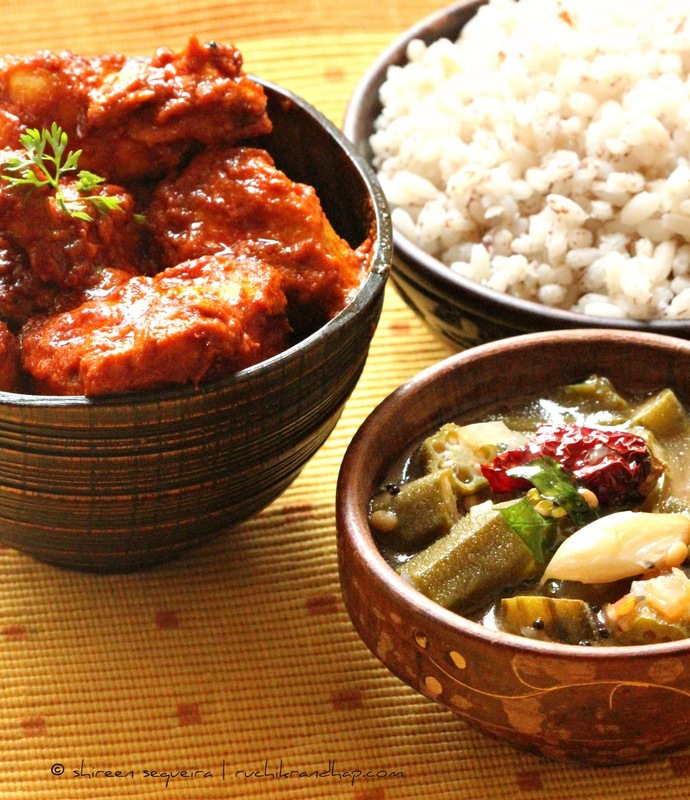 Ideally Mangalorean/Coastal food tastes the way it does because of the signature flavour rendered by local chillies namely Bedgi/Byadge (long dry red chillies) or Harekala (short dry red chillies) – you may try a blend of both. Since the recipe constitutes a large amount of chillies that give the required quantity for the masala, you may substitute the chillies mentioned above with Kashmiri chillies. Try the Ghee Roast if you’ve never eaten it before – but it’s definitely not something you can eat everyday as it is extremely rich thanks to the ghee. A perfect accompaniment to Neer Dosa, Dosa, Boiled Rice or even Chapathis and a perfect party dish. 2. Heat a tawa or non stick pan & dry roast the chillies, peppercorns, fenugreek, coriander & cumin seeds. Take care to see that the chillies don’t burn otherwise they will let out a bitter taste. Using a little water grind all these ingredients along with the garlic & tamarind to a fine paste. Retain the masala water from the mixie. 3. Heat 1/4 cup of ghee in a wide thick bottomed pan and add the marinated chicken pieces and cook over an open flame till the pieces are almost cooked. Transfer the pieces to a vessel and the liquid (gravy) to another bowl. 4. In the same pan add the remaining ghee and fry the ground masala for 5-6 minutes or till the raw smell vanishes and the oil leaves the sides of the pan. 5. Add the fried chicken pieces 1/2 cup of the reserved liquid & salt to taste (remember that the marinade already had salt – so go easy on the salt). Cook on a medium high flame till the masala dries up. Add the sugar & mix. 2. If you wish increase the Kashmiri chillies upto 30 chillies – note that Kashmiri chillies are great for their colour but are less spicy. You can use a blend of Bedgi (medium spicy) or Harekala (very spicy) for the desired level of spice. To tone down the spice I always de seed (remove the seeds) the chillies before roasting them. If I am serving this dish to people who have low tolerance to spice I use just7-8 Bedgi (spicier than Kashmiri chillies) chillies with the seeds removed for 1kg chicken. 3. Increase the Fenugreek seeds (Methi) upto 1/2 tsp if you prefer the chicken slightly more bitter. Though being a vegetarian I just could not help staring at this preparation. What an eye catching color? I'm sure Arun, when he sees this is going to invite himself over to your home whether you like it or not. Clicks are so delicious Shireen. 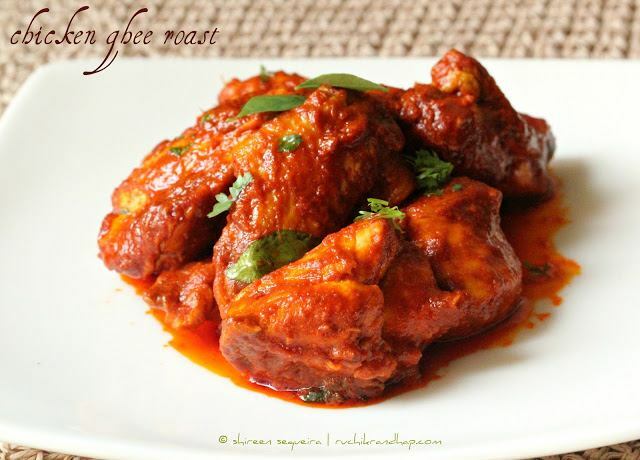 Delicious ghee roasted chicken..drooling over thse pictures!! I would be lying if I didn't say I drooled at your pics.. Oh, I so want to taste ghee roast.. They are attrociously yummy! 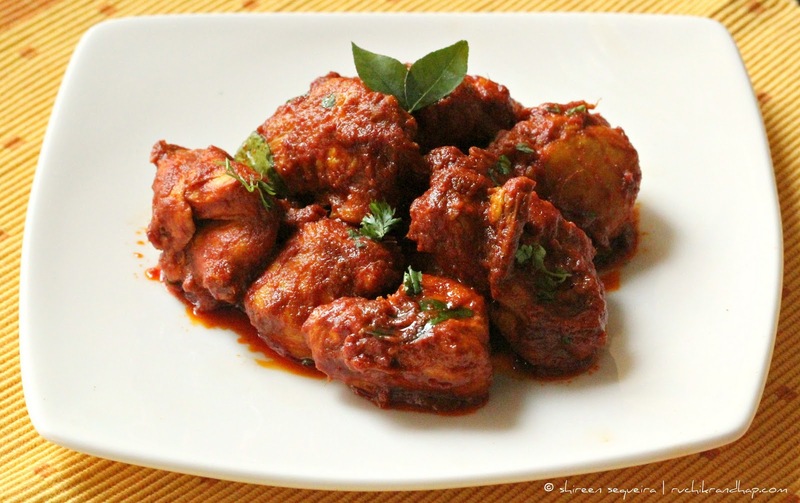 wow..chicken ghee roast looks super yum m tempting…lovely pictures too!!! Omg, seriously cant take my eyes from those clicks,super tempting chicken roast.. 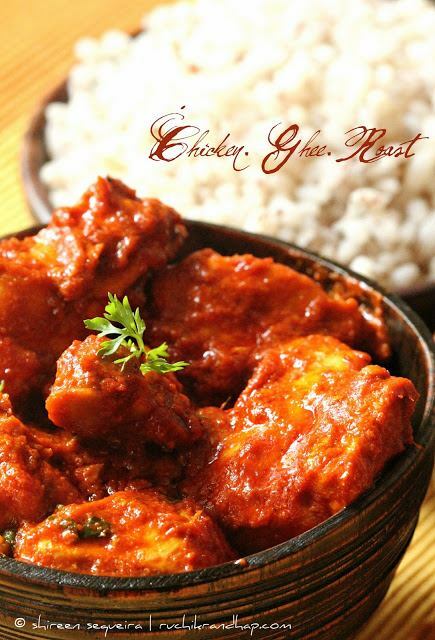 Delicious and inviting looking ghee chicken roast. Wonderfully prepared. Ohmigod!!! 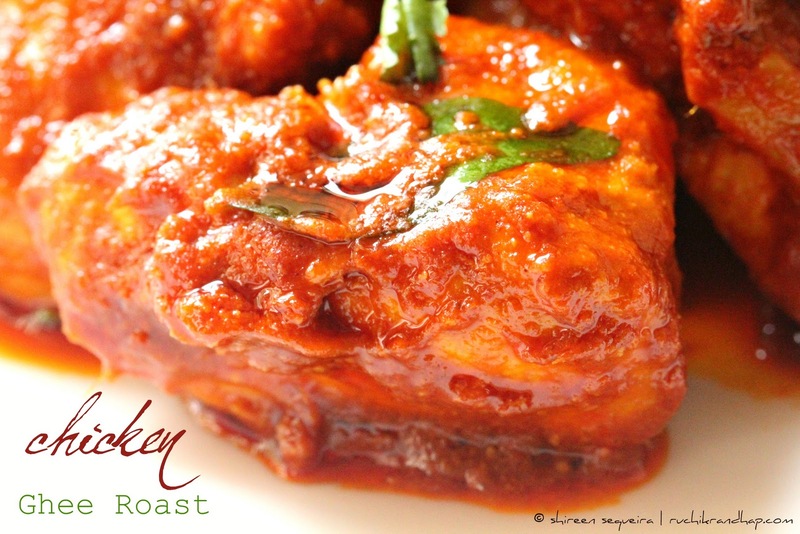 I love chicken ghee roast, and what do you know, I happen to have a couple chicken pieces sitting in my freezer. This is going to be on my menu soon! My my..this is just amazing Shir!!! Looooooved the roast and the clicks. Its just too good. The colour and presentation is THE BEST! Roasted chicken looks excellent drooling over pics..
Never heard of this curry , loved the info on chillies. I did try the mackerel recipes, so also the spinach with black eyed peas gravy(when and as the latter was available). Both the dishes came out suuupeerrrr!!!!! Haha, thanks Ramona!! Did he get to know this site before, or did u? Either ways, doesn't matter – I wish ur hubby all the best! Lemme know the results!! @Priya: Thanks so much for the feedback! So glad you tried it with prawns n liked it too! Tried it yesterday, and it's fantabulously 'Ruchik Randhap'!! Lovely Shireen.. This was my first attempt of making Chicken Ghee Roast.. It was lovely and all my guest literally licked their plates clean.. Hats off to you.. Thanks once again.. Thanks a ton Wendy!! Sounds great! So glad your guests liked it..'licking the plate' is the biggest compliment!! Shireen – I was wondering if the garlic is ground with the skin, won't the skin be an issue while eating? Or does it disintegrate when cooked? Please let me know. Hi Shireen, though I left a comment on pinterest, thought it better be here! The chicken turned out fab and my young sons & husband absolutely loved it. Hi Tanya, thanks a ton for your feedback :)) I love to hear success stories and I am very glad that the chicken was liked by all at home, take care & will wait for your feedback on my other recipes as well! Your pics are too good. Thanks Sonia!! Glad u enjoy the blog!! shireen i always appreciate yr quick reply thank you soooo much definetly i'm going to try yr receipe & get you posted. Hi shireen, I tried your recipe today and it was absolutely delicious! Me and my family loved it. It was lip-smacking.! Will definitely try it again. Thanks a ton for this wonderful recipe. OMG. This looks delicious. I wouldn't know how to make it. I do make curries but very easy ones and mainly a chicken curry more or less made up. @ Judy: Thanks so much! Pls email me on ruchikrandhap@gmail.com if you need more help with it. Hey shireen. Tried this recipe. Was wonderful. I had guests over whoto do njoyed it as well. Had a small question. The gravy was less. I would like to have more gravy. What can I add more to that? Glad to hear that! Well, you won't be able to get a lot of gravy in this recipe but maybe you can add some more unsour curds and maybe extra skins of chillies (use kashmiri chillies without seeds – that way it will help you increase the gravy a bit without increasing the spice). Hope it helps! Hi Shireen!I love all your recipes.I wish you were on you tube….would love to see you cook . @ Roopa: Thanks a ton darling! I do hope you try this recipe and enjoy it too! i generally dont follow recipes to tee…bt your chicken recipes certainly inspire my kitchen experiments. Bt I completely followed your ghee roast recipe…and glad I did. its a huge hit at home and even with all the guests. i made it for my parents when I visited them and now its their fav chicken dish…it also y to go dish when i dont want to exprient or am skeptical of the guests choices and this dish ever fails to please. I discovered ghee roast when I came to Mangalore for college. It was always a comfort food. And i have been missing it so much ever since I came home. Finally I decided to give it a try. Ur recipe helped me get the flavours really well. Thanks so much. My family loved it too. 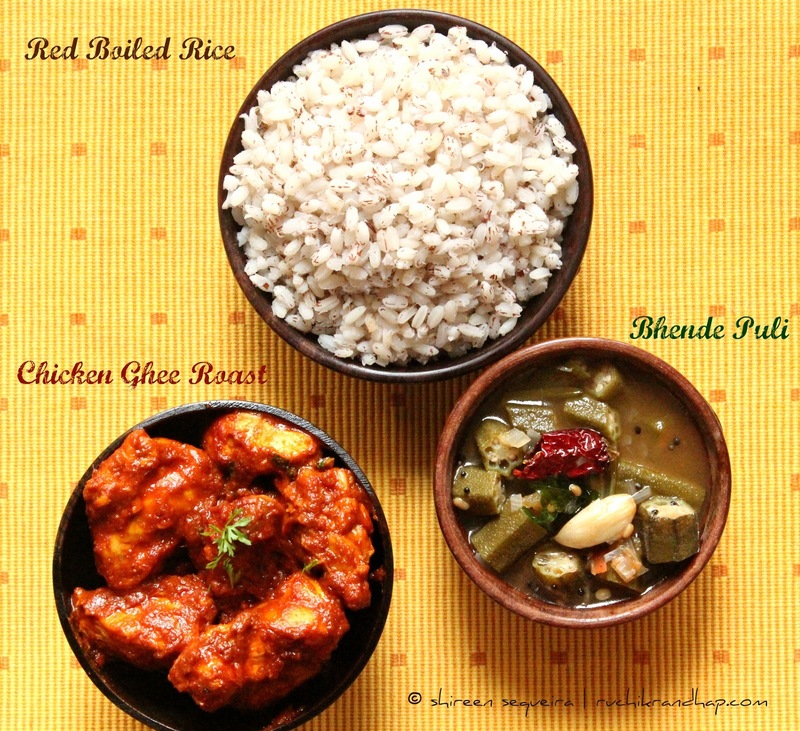 @ Astha: So glad to know that the recipe worked for you and you were able to reminisce the old times in Mlore! 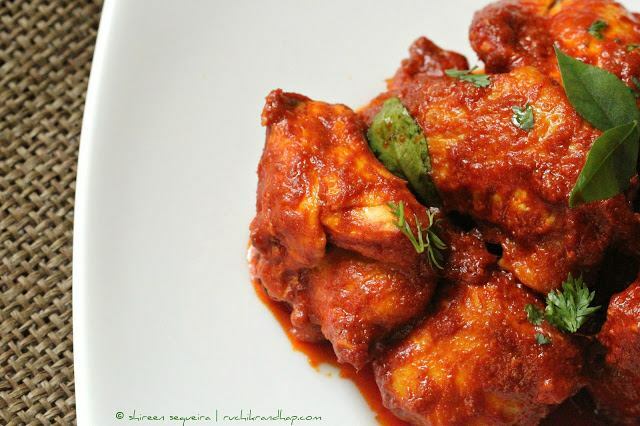 Hi Shireen, I have used quite a few chicken recipes from your blog and they have always been so flavourful. Just made the ghee roast today and as usual….it was gorgeous. Besides actually following your recipes, I enjoy reading your writing and your recipes make me smile as they bring back memories of long summers spent in Mangalore. @ Unknown: I will surely post the recipe of bhende puli soon 🙂 thanks for your lovely comment! It came out well but too spicy..Anyways to reduce the spiciness..Will adding roasted coconut help..
@ Unknown: Sorry to hear that. I had mentioned in Note#2 about how one can tone down the spice. You can add a paste of coconut milk powder or use coconut milk to reduce the spice. However, doing so will alter the taste. Yours is perhaps one of the best comments I have ever received! Thanks so much for making my day! I am so glad that you enjoyed this recipe so much! !